Yardage: 6,885 from back tees. After playing Doonbeg in 2002, Padraig Harrington said “I didn’t think that anyone could build a course like this in this day and age." Developers had, in fact, been looking at this stretch of high dunes on the Clare coast as possible course site for over 100 years. Legend says that Scottish Black Watch Regiment officers who created the course at Lahinch would have built here instead, had it not been for a lack of transport lines to the site. Whatever the reason, it was not until 1999 that construction of a course began here, under the design direction of Greg Norman. Since play began on Doonbeg in 2001, lots of golfers and writers have echoed Harrington’s reaction, calling it the “last great links course in the world." Doonbeg’s undulating greens are the #1 challenge for most. Norman says many of them were simply cut out of the existing grass and topography. Stopping your ball on the small, elevated greens on 3rd and 6th holes, in particular, requires a quality short game. Fairways here are a bit more manicured than on some links and actually quite wide – a good thing since the rough is so thick that if you spray your ball wide, most caddies won’t even bother to look for it. Deep bunkers, some with walls built of sod bricks, evoke the classic links of Scotland and the bad memories of golfers, both amateur and professional, who’ve been trapped in them for multiple shots. “Although a relative newcomer, the first hole at Doonbeg is already hailed as the best starting hole in Ireland," according to “1001 Golf Holes You Must Play Before You Die" (Ronnie Sellers Productions). The immense dunes guarding the green here are indicative of the monsters you’ll be encountering throughout the course. But Norman’s design touch really shines through on the unique and wonderfully varied shorter holes. The par-3 14th is only 111 yards long, but is often called the toughest on the entire course. It features a tight hourglass-shaped green that only the most accurate hitters will reach on the first try. The whole course, says Norman, was designed around the next hole, the 440 yard long 15th, a par 4. Playing along the ocean, it requires a second shot to a green surrounded by dunes that seem like small mountains. If you’re able to hit the front of the 150-foot-long green perfectly, you still have to hope and pray your ball doesn’t run all the way down off the back end. Sports Illustrated has called these two holes the “best par-3 and par-4 and southwest Ireland." You may feel a little less friendly toward Greg Norman by the time you come in off Doonbeg. Devilish touches like the bunker square in the middle of the 12th green and the monstrous 15-foot-deep sand crater in front of the 11th green tell you the Great White Shark was intent on making sure no one would have too easy a ride here. He allegedly told builders he “didn’t want some 8-handicapper to come in and tear up this course." Padraig Harrington said the course made him focus on keeping the ball lower, adding “I expected flat greens and flat fairways, but this is a great mental test.."
Whether you pass or fail depends on your game – and your scoring expectations. Some golfers will tell you that because of its width, Doonbeg isn’t unreasonably tough at all. What everyone agrees on is that this is a rare links that combines the careful architecture of modern courses with a spectacular, even haunting scenery of Ireland and Scotland’s oldest courses. 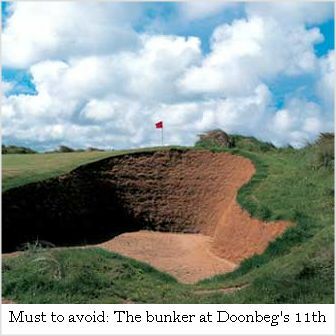 As Golf Digest’s architecture editor Ron Whitten has said, this course is a genuine Irish links of “unexpected breaks" and “unanticipated results," adding that “Doonbeg looks and plays like it has been there for a hundred years."